One of the high points from a scientific standpoint this year was the discovery in August of the USS Indianapolis on the floor of the Pacific Ocean by undersea adventurer and billionaire Paul Allen, more than 70 years after it was sunk during World War II, and thirty-two years after undersea explorer Robert Ballard first discovered the location of the wreckage of the most well-known maritime disaster, the sinking of the RMS Titanic. In 1995, 2001, and 2005, director James Cameron, well-known already for Aliens, the first two Terminator movies, and True Lies, would take knowledge he learned filming The Abyss to pursue a lifelong dream of undersea explorer in Ballard’s and Jacques Cousteau’s footsteps. Ultimately Cameron would make thirty dives on the site of the wrecked RMS Titanic, more than anyone, first for footage that would be used for his film Titanic (which would win 11 Academy Awards), and later for pure scientific knowledge and exploration. Cameron documented his expeditions in his book Exploring the Deep: The Titanic Expeditions, now available in a paperback edition from Insight Editions. One of the low points of the year was the death of beloved actor Bill Paxton. What many people may not know is the role Paxton (known for dozens of films including Edge of Tomorrow, True Lies, Aliens, and Tombstone) played in the exploration of the real Titanic after starring in Cameron’s film Titanic. He accompanied Cameron on four deep-sea dives, documenting his experiences and serving as narrator on one of Cameron’s documentaries, the 2003 film Ghosts of the Abyss. In his foreword to Exploring the Deep: The Titanic Expeditions, Paxton notes his reservations of traveling to the ocean floor. “At the time, because I had young children at home, I felt it was more risk than I should be taking,” he said. He spoke highly of Cameron, “He is someone who values his friendships and has a deep appreciation of just how brief our time on earth is–and he’s determined to make the most of it.” The feeling was mutual. Of Paxton, Cameron wrote, “Bill has become the pitch-perfect explorer. He acquired the clipped tone of a test pilot when he played Fred Haise in Apollo 13, and of course he played treasure hunter Brock Lovett in the Titanic movie, but if he’s playing a part now, it’s merged so perfectly with reality that there is no difference. He’s now a real explorer, and this is a real mission, two and a half miles down.” Indeed, half the fun of Exploring the Deep is following Paxton via his words and photographs in his adventure, adding his own insights and bits of humor along the way. James Cameron and Bill Paxton exploring the remains of the Titanic two and a half miles down on the floor of the Atlantic Ocean in Exploring the Deep: The Titanic Expeditions. But it’s the knowledge learned by Cameron one hundred years after the Titanic sank that makes the book compelling and thrilling and even chilling at times. Cameron, along with the other leading experts in Titanic history–Dan Lynch, Ken Marschall, and Parks Stephenson–lay out each expedition step by step, including development of the technological tools created by Cameron to be able to film the ship and eventually more easily maneuver the rooms inside the ship’s remains, something no one else had yet done. The book includes a detailed log written by Cameron for the fifth dive in September 2001, including recollections of his historical research as he observed actual locations on the ship tied to known events and passengers, some famous, some members of the crew. He uses photographs of the Titanic’s sister ship, the RMS Olympic, to highlight identical artifacts inside the ship. Many artifacts surprisingly are still intact, like mirrors, windows, glassware, and dishes–and equipment in the Marconi Wireless Telegraph rooms, which were instrumental in saving the 706 survivors. Where possible he includes rare photographs taken the day of or just before the Titanic went to sea on its maiden and only voyage, and otherwise he incorporates for reference Ken Marschall’s detailed paintings, Parks Stephenson’s computer-generated simulations, and his own recreations used in his film Titanic–all with an eye toward conveying to readers what Titanic looked like in 1912. JAWS–It’s the reigning king of summer blockbusters–the movie that even prompted the term blockbuster throughout most of the U.S.A. in 1975 because of its crazy long theater lines. It’s still a favorite of those lucky enough to see it in the theater that summer (drive-in, in my case), and absolutely re-watchable like no other film. Steven Spielberg directing the toughest shoot of his career, special effects that had to be ditched, a stunning score by John Williams, Richard Dreyfuss at his dramatic funniest, Robert Shaw at his finest. And coolest. Robert Shaw. The Oscar-nominated actor from The Taking of Pelham One Two Three, Force 10 from Navarone, and From Russia With Love, turned 86 this month. To celebrate, Narragansett, the brand of beer that Shaw drinks on-screen and the can that he crushes in that famous Jaws scene, re-released its famous 1975 commemorative beer can this summer. Don’t remember the scene? Check it out below. Narragansett timed its release with Shaw’s birthday August 9 and Shark Week. Unforeseeable to the beer company, Quint was brought back into the limelight later in the month with the discovery by Paul Allen and his research team of the actual USS Indianapolis shipwreck some 18,000 feet below sea level on the floor of the Pacific Ocean. Shaw and Spielberg have been praised by survivors for the realism provided in the movie. It’s a dose of reality in what was otherwise a summer action movie. Yet we surmise the story of the tragedy might not have received the prominence in history it deserved, and maybe Paul Allen might not have learned of the ship to seek it out, without the pervasiveness of the film today, and the lore it perpetuates. Fortunately 22 of the original sailors that survived that fated voyage are still with us. Narragansett is the beer Theodor Geisel aka Dr. Seuss created ads for. Unlike Morley cigarettes (which we discussed back in 2011 at borg.com here), Hank Hill’s Alamo Beer, Thomas Magnum’s Old Dusseldorf longnecks, Al Bundy’s Girlie Girl Beer, Homer Simpson’s Duff Beer, Laverne & Shirley’s Shotz Beer, or Drew Carey’s Buzz Beer, Quint was downing and crushing a can of real Narragansett. Still brewed today, it’s the preferred beer of many in the Northeast and Eastern U.S, where it is distributed. The iconic movie scene solidified the brand’s reputation as the beer of choice for everyday New Englanders and continues to captivate viewers to this day. The company offers many great fan products, so make sure you check out its website store for items like its throwback can Christmas ornament, a great two-sided throwback T-shirt, and “Crush it like Quint” full-sized poster. Philanthropist Paul Allen is known by many as the owner of the Seattle Seahawks and the Portland Trailblazers, but he’s also known by space technology and science enthusiasts and science fiction fans. In addition to co-founding Microsoft and earning billions allowing him to fund myriad projects, he owns the suborbital commercial spacecraft SpaceShipOne, the Allen Institute for Artificial Intelligence, and the Museum of Pop Culture in Seattle, which houses several screen-used props and costumes from the history of sci-fi TV and film, among many other educational, charitable, and influential enterprises. Recently Allen used his wealth to begin to earn his sea legs as the next Dr. Robert Ballard, the ocean explorer who discovered the shipwrecks of the R.M.S Titanic in 1985, the battleship Bismarck in 1989, the USS Yorktown in 1998, and John F. Kennedy’s PT-109 in 2002. In 2015 expeditions Allen and his team discovered among the ocean’s depths the bell to the British vessel HMS Hood and the remnants of the Japanese battleship Musashi, and earlier this year he located the wreckage of the Italian destroyer Artigliere. Yesterday Allen and a small expedition crew on the research vessel Petrel discovered what was thought unfindable: the remains of the World War II cruiser USS Indianapolis (CA-35). Allen’s discovery off the coast of the Philippines, 18,000 feet below the surface of the Pacific Ocean, now puts him in league with Ballard, and more importantly, will hopefully bring closure to the 22 remaining survivors of one of the most famous ships in modern history to meet a dire end at sea. Ship’s bell of the USS Indianapolis as photographed by the crew of the research vessel Petrel Saturday. In the final days of World War II, the USS Indianapolis had completed delivery of components of the atomic bomb to the island Tinian. Dubbed “Little Boy,” the bomb would be dropped on Hiroshima, precipitating the end of the war. The mission was secret, and so on July 30, 1945, when Japanese submarine I-58 struck the ship’s starboard side with two Type 95 torpedoes–one in the bow and one amidships–the Indianapolis sank within 12 minutes, but tragically was not listed as overdue. By the time a rescue party arrived, more than four days had passed and the approximately 800 survivors of the 1,196 crew ship dwindled to only 316, resulting from dehydration and shark attack. A fantastic National Geographic compilation of interviews from 2015 provides first-hand accounts from surviving sailors of the Indianapolis’s end 72 years ago. But you already know this story. Thanks to Steven Spielberg’s Jaws, the Indianapolis has been etched in modern memory since the film’s debut in 1975. Without the fictional character of Robert Shaw’s seaman Quint, the Indianapolis might be but a forgotten footnote to history along with so many equally valiant ships lost in wartime. The Indianapolis is now a revered part of the American consciousness along with the USS Arizona, and it’s doubtful anyone would have pursued this project but for the importance and tragedy of this ship’s crew communicated to us by a film, and amplified by that film’s continuing legacy. They have watched every Star Trek series and episode right along with you. So why not let them lead the way on the next mission? 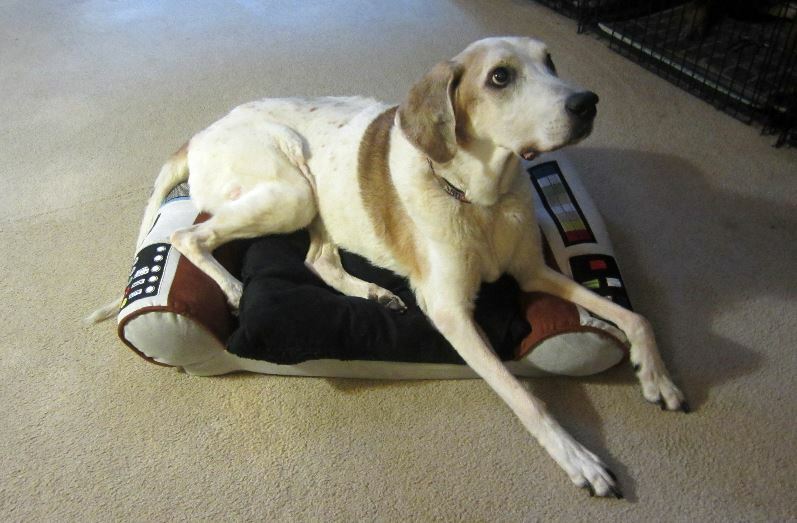 You can now get your own Captain’s Bridge Chair in the style of the original Enterprise NCC-1701, for your best friend. And heck, maybe your cat would take to it, too. The chair is 32 inches wide by 27 inches long and features a cozy… erm… “officer-style” faux-suede fabric, a smart gold-embroidered delta shield insignia, and embroidered command panels and buttons on each arm. Officer thinking! Heading, Mr. Chekov? Second star to the right, and straight on til nap time. The chair is made by The Coop, formerly known as A Crowded Coop, a Pacific Northwest-based creator and marketer of licensed consumer products focusing on pop culture for people and pets. And it’s available through Entertainment Earth at this link.